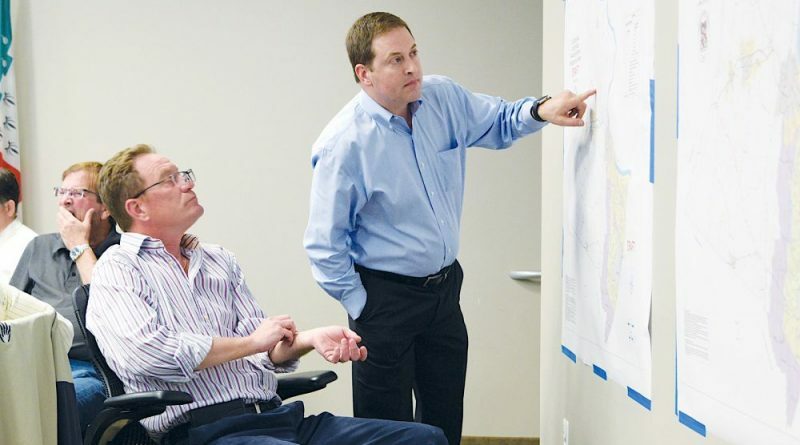 The Envision Loudoun stakeholders committee that has spent the past two years chiseling out the planks of the county’s next comprehensive plan got the first look at the 231-page compilation of its work Monday night. Next Monday, the public will see it, too. The panel’s two dozen members—representatives of various industry segments and community organizations appointed by county supervisors—held 39 formal meeting and devoted countless hours crafting and reviewing community development polices intended to guide Loudoun’s growth through 2040. They first convened June 20, 2016, with the goal of handing off a draft plan to the Planning Commission by that October. That schedule proved to be aggressive as the panel worked with a team of consultants to create a new vision of urban-scale development along the Silver Line, debated the merits of allowing more development in the Transition Policy Area, and sparred over how much new housing could, or should, be accommodated and where those homes should be built. While members of the diverse panel continue to disagree on a number the hot-button issues, the plan that will be presented for public review during a series of open house sessions this month will be presented as representing a consensus of the committee. The panel will meet only twice more. On June 18, it will review the public’s reaction to the plan. On July 9, it is scheduled to learn—for the first time—the fiscal impact the draft plan’s recommended policies will have. It also will learn whether the road network and transit systems outlined in the revised Countywide Transportation Plan can be expected to function adequately. If either of those models identify major concerns, it will be the Planning Commission’s job to work them out before passing its recommendations to the Board of Supervisors this fall. Since the earliest rounds of the Envision Loudoun work, the key question has been how much more development will be allowed in the county. Under the draft plan, the county is expected to see construction of 44,614 additional residential units by 2040. That’s about 15,580 more than would be expected under current planning and zoning rules, according to preliminary staff modeling presented to the committee on Monday. Of the overall total, 11,600 new homes are expected in the Transition Policy Area and another 7,500 in the western countryside. The rest are planned in eastern Loudoun—in new high-rise urban centers along the Dulles Greenway and along Rt. 7 near Rt. 28, and in lower density mixed-use communities and redevelopment zones. Work to assemble a compete draft plan has been on a fast track since February, when the Board of Supervisors turned management of the project over to Deputy County Administrator Charles Yudd—the second-highest-ranking administrator in Loudoun’s government—and new Deputy Director of Planning and Zoning Alaina Ray. This graphic shows the planned land uses in the Suburban Policy Area in the draft 2040 General Plan. The committee spent five weeks in March and April reviewing first drafts of some of the plan’s chapters, but Monday night was the first opportunity to review the entire document, including a 54-page section listing next-step implementation tasks. It was reviewed in a two-hour, speed-round-style session when members took turns proposing last-minute policy additions or deletions, suggesting wording tweaks, or pointing out corrections. Among the final changes was to add policies highlighting the important role colleges are expected to play in economic development and workforce training, added after committee member Julie Leidig, provost of the Northern Virginia Community College Loudoun Campus, pointed out the plan didn’t mention higher education at all. The work of the committee and the planning staff will get its first public review starting May 7. That’s when the complete document will be posted online at envision-loudoun.org where the public will be able to submit comments through June 1. There also will be six community open house meetings around the county where residents and business representative can review elements of the plan, talk with county staff planners, and record their comments. The first session will be held Monday, May 14, atHarmony Middle School west of Hamilton from 6:30 to 8:30 p.m. While most committee members agree that they have taken the plan as far as they can and that it is time to turn the project over to the Planning Commission and Board of Supervisors to finish the job. 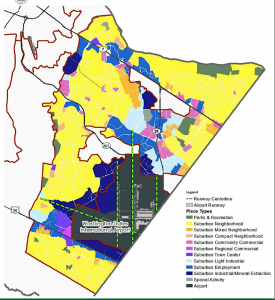 However, views differ on whether the draft plan will adequately guide the county’s growth in the coming decades. The differing views were illustrated in one exchange Monday night. Michael Turner, appointed to the committee by County Chairwoman Phyllis Randall, said the panel’s draft meets his goals of creating a plan that is better than the Revised General Plan adopted in 2001—more understandable, flexible, and easily updated—and would provide a good guide for use by the county Board of Supervisors. He said it was a great plan. Al Van Huyck, representing the Loudoun County Preservation and Conservation Coalition on the committee, was an architect of the 2001 plan as a planning commissioner. He predicted the plan would be met by widespread public opposition for its failure to control growth and protect the environment. He said the plan is too vague and that its toothless policies would leave county leaders unable to turn away developers’ plans. With a shake of the hands, both bet a steak dinner that his assessment would be borne out in the weeks ahead. Noting the nearing end of a remarkable term of service for a volunteer group of community leaders, Planning Director Ricky Barber thanked the committee members for their work. The public is invited to learn more about the proposed 2040 Comprehensive Plan during a series of open house-style meetings in May. Monday, May 14at Harmony Middle School, 38174 W. Colonial Highway near Hamilton, 6:30 to 8:30 p.m.
Wednesday, May 16atHarper Park Middle School, 701 Potomac Station Drive in Leesburg, 6:30 to 8:30 p.m.
Monday, May 21at the Loudoun County Government Center, Dulles Room. 1 Harrison St. SE, in Leesburg, 10 a.m. to 2 p.m.
Monday, May 21at Eagle Ridge Middle School, 42901 Waxpool Road in Ashburn, 6:30 to 8:30 p.m.
Tuesday, May 22at Cascades Senior Center, 21060 Whitfield Place in Cascades, 6:30 to 8:30 p.m.
Thursday, May 24at John Champe High School, 41535 Sacred Mountain Street near Aldie, 6:30 to 8:30 p.m.
For more details and update, go to envision-loudoun.org. While I applaud the Envision Loudoun article’s disclosure of the remaining housing densities from today to 2040 for transparency, there is not an explanation explaining the majority of the increased density remaining to be built are “by-right” housing approved under 2001 plan versus the new draft plan. It appears that the Staff and the Stakeholders approved ~45,000. The missing information is the housing density already approved under the 2001 plan and then a separation disclosure as to the increase from the Stakeholders work. Both sets of numbers are important and the numbers should broken down by planning area. Example the 7,500 houses to be built in the Rural Policy Area were under the 2001 plan. And yes 7500 in primarily the Northern Rural area is an challenge. The Stakeholders did not approve any additional houses in the RPA. Same with the majority of the Transition Policy Area. The increase in housing units recommended by the Stakeholders group was around the Silver Line Stations and some infill and redevelopment in the Suburban area. Mr. Van Huyck is right the public will be very engaged on these increase densities without the explanation that other then the 2 areas Silver line metro stations and Suburban infill mentioned above, the increase housing densities are from the 2001 plan and already in the pipeline to be built. Mr. Van Huyck’s has an easy win of steak dinner from Mr. Turner. Should have opted into that bet! Let’s have a good dialogue but with a good understanding of what we can change and what is already in the cake we are baking.